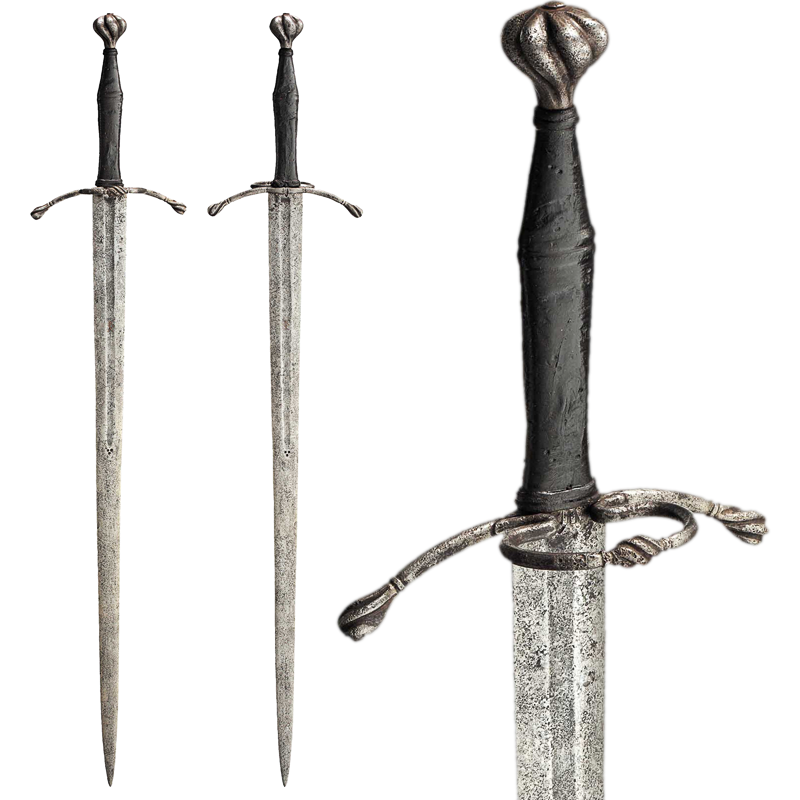 Double edged, wide blade with strong central ridge dating to the 2nd half of the 16th century. Slightly curved, iron quillons with ball finials. The forward guard-ring is filled with an openwork guard plate. On the rear is a thumb-ring. Finely stippled leather covered with brass wire-wrapped grip. The biconical pommel and cut all round with four flowers in relief. Composite sword compiled from old parts. 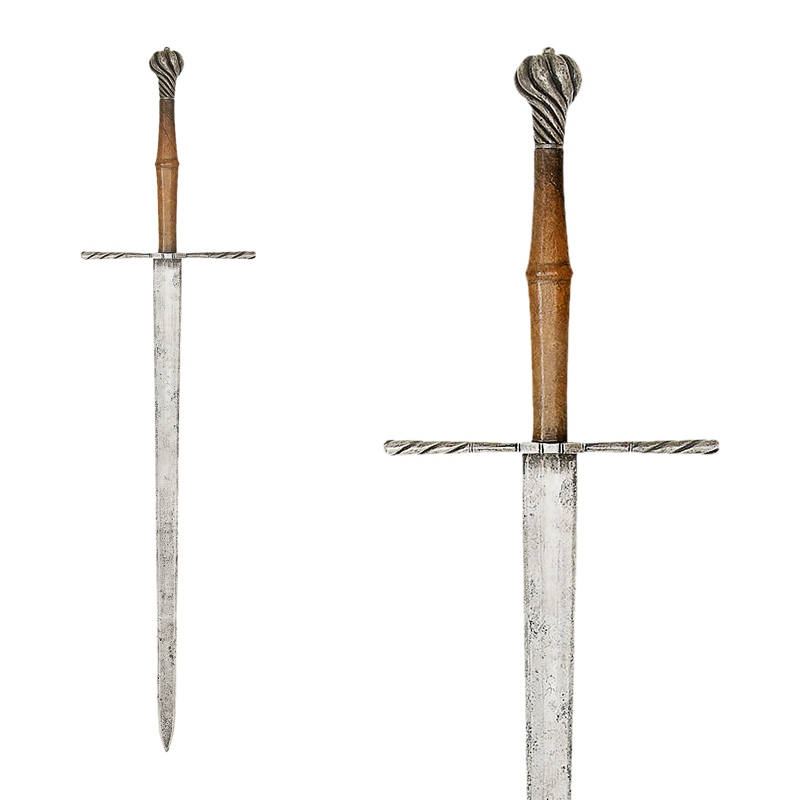 Double-edged blade with wide fuller running up the first third of its length having a maker's mark on each side. The long ricasso is incised with decorative lines. 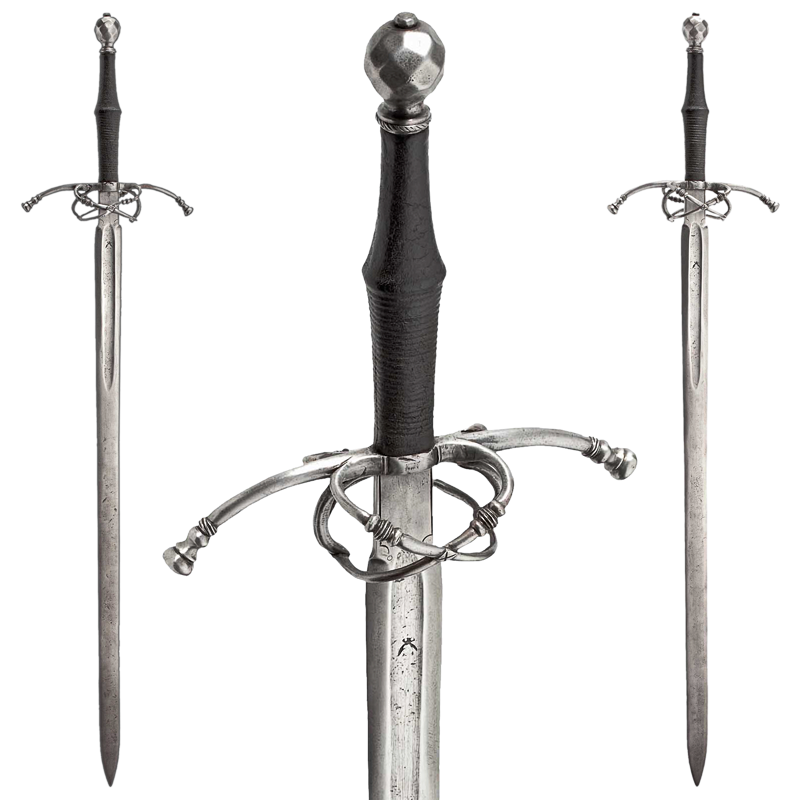 The symmetrical hilt has down-swept quillons with ball finals and a faceted pommel. The ricasso struck with two maker's marks. Long, double-edged blade with a short fuller on each side and having a stylized wolf makers mark. 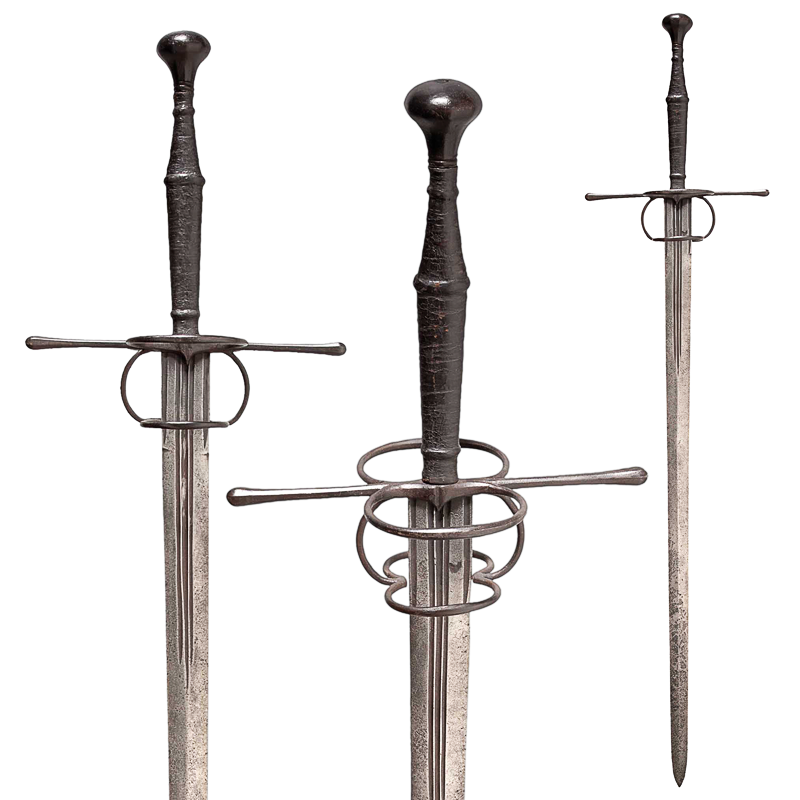 The strong ricasso has the crescent-shaped brand of Munich's bladesmith Diefstetter. 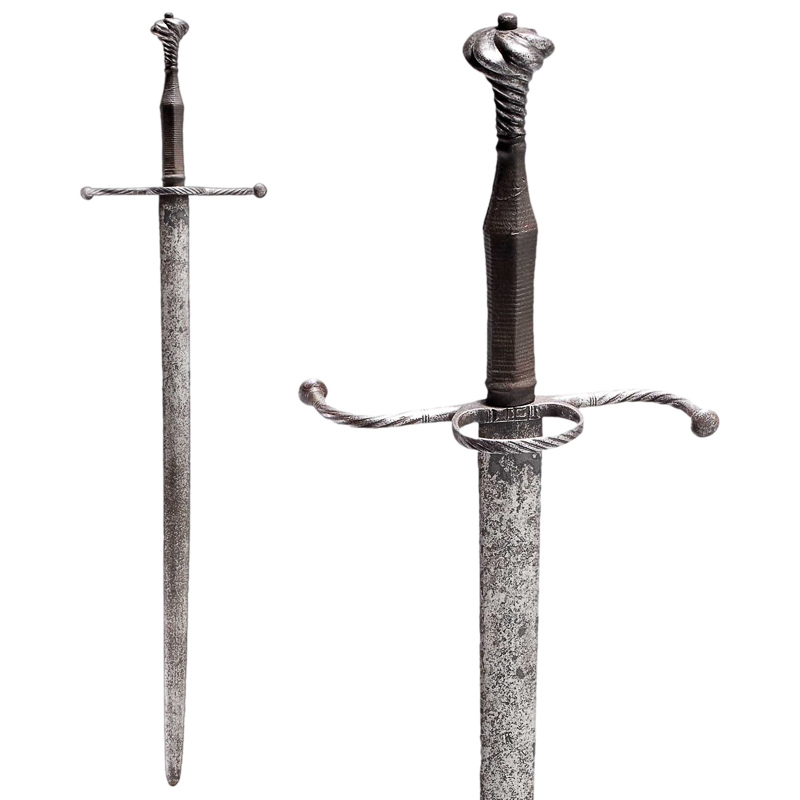 Iron, brown black patinated swept hilt with a rectangular guard and six-faceted pommel. Original (minimally damaged) spirally-fluted grip. 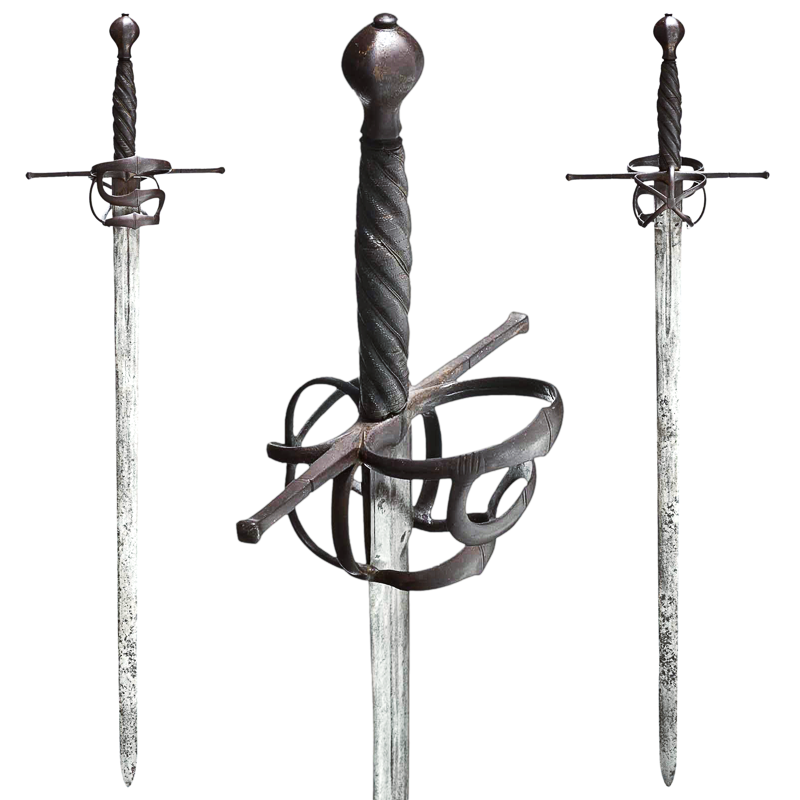 Blackened hilt; heavy, round pear-shaped pommel; shouldered grip bound with black leather slightly tooled in the upper section, the lower part corded; straight quillons of circular section swelling at the ends; double side-rings on each side and a finger-ring either side of the blade; single-edged blade of triangular cross-section (except at the tip where it is double-edged) with twin fullers and ricasso; blade is inlaid with a maker's mark in copper. 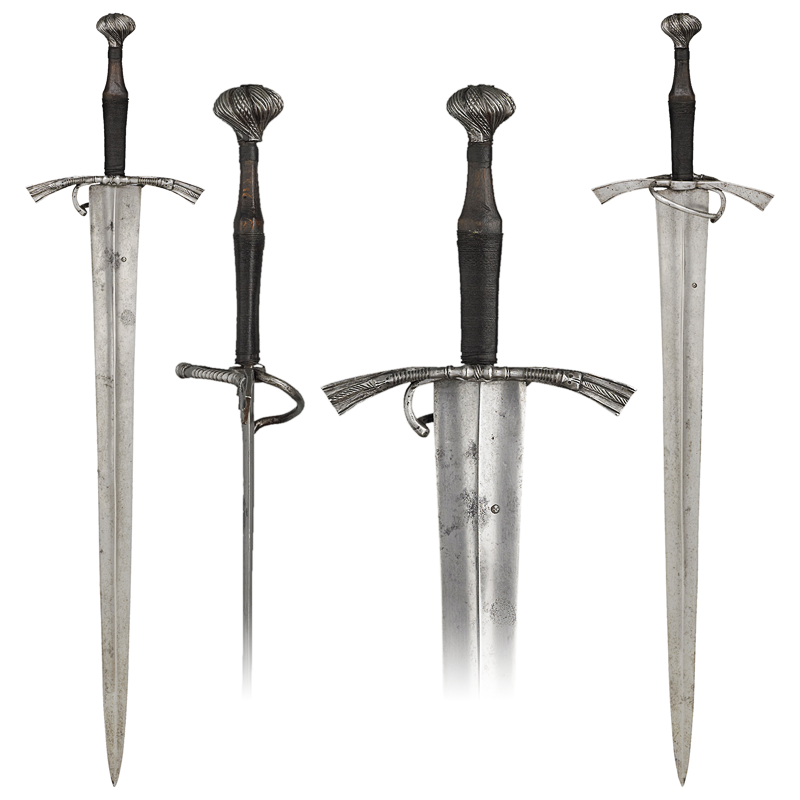 Blued hilt similar to The Wallace Collection A.480 and A.485. Inverted, cone-shaped pommel of octagonal section; shouldered grip bound with fish-skin; straight, spatulate quillons; knuckle-bow, single side-ring and knuckle-guard of diagonal bars; double-edged blade is flat, fullered near the hilt and stamped with a maker's mark on both sides. 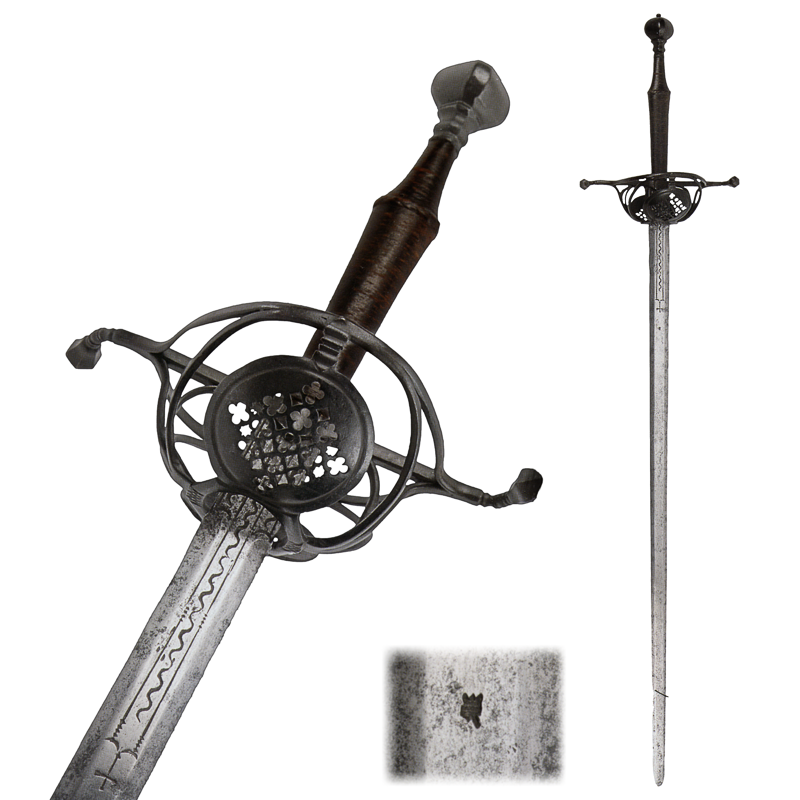 The hilt and spatulate quillons and semi-basket guard for the knuckles is characteristically German of the middle of the 16th century, though the mark on the blade is Italian in character. Nos. 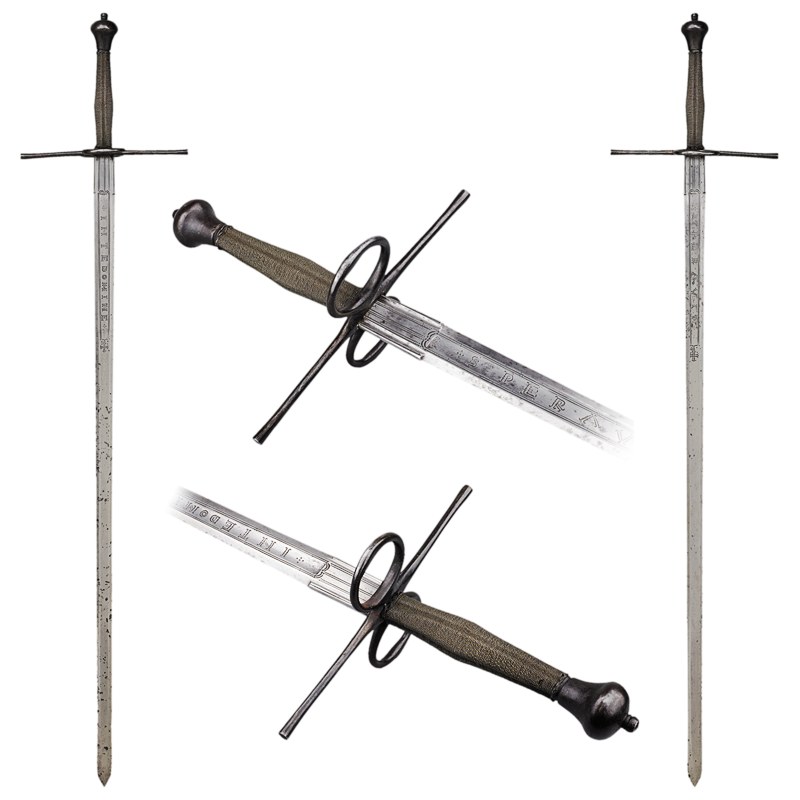 A.480 and A.485, which have similar hilts, retrain their original German blades. 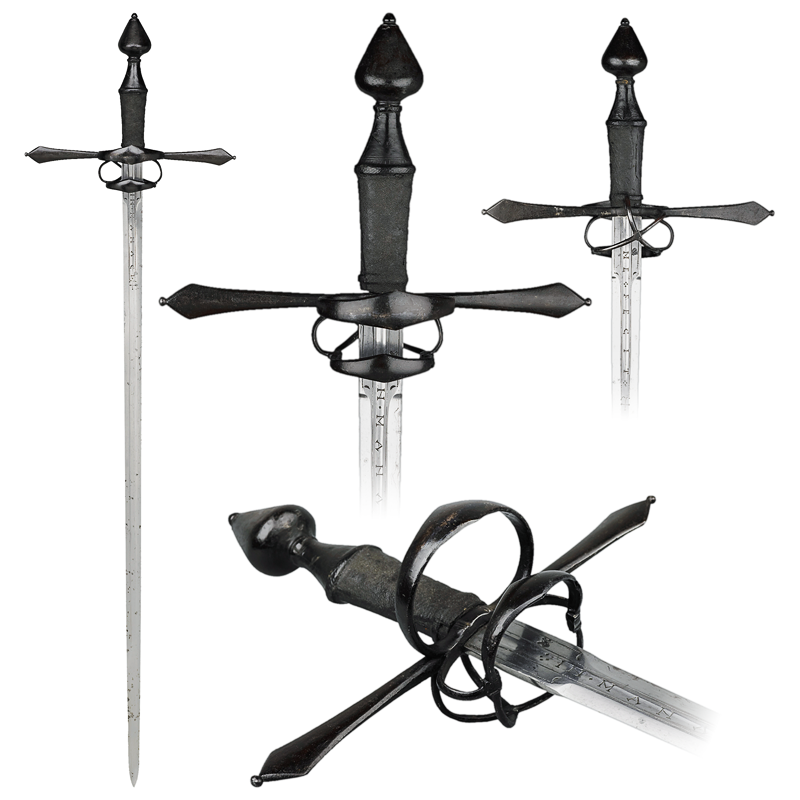 Blackened hilt; fig-shaped pommel; straight guard of circular section, swelling at the ends; simple side-ring on each side; fluted wire-bound grip; blade of flattened hexagonal cross-section, fullered and incised with lines. Extremely similar to Wallace Collection A.493; similarly inscribed but of slightly larger dimensions. Original blackened hilt. The blade of hexagonal cross-section having a ricasso struck with a maker's mark. The upper flat part of the blade engraved with ornamental decoration. Strong, double-edged blade with double-X-shaped copper maker's mark in the fuller. 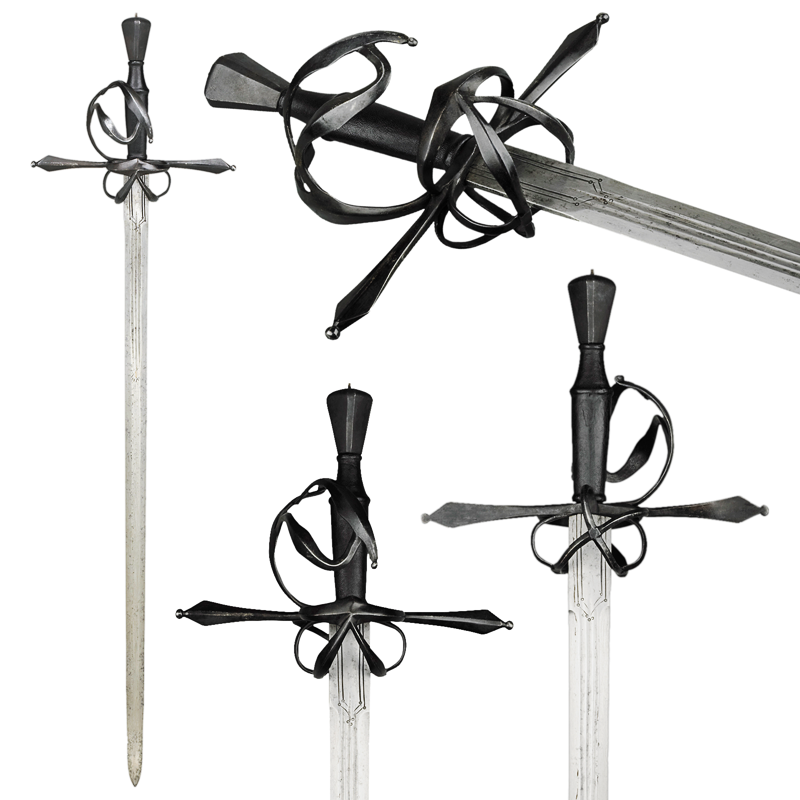 Curved cross-guard made of iron with pear-shaped, fluted finials and large guard ring on one side. Leather-covered grip with spirally-fluted six-sectioned pear-shaped pommel. Blackened hilt. Onion-shaped pommel; shouldered grip of wood bound with fish-skin and leather, long straight spatulate quillons; double side-rings, thumb-ring and finger-rings, all of flattened oval section; double-edged blade of hexagonal section, single fuller towards the hilt and inscribed: IN MANACI ME FECIT with a strong ricasso bearing the marks of Melchior Diefstetter. 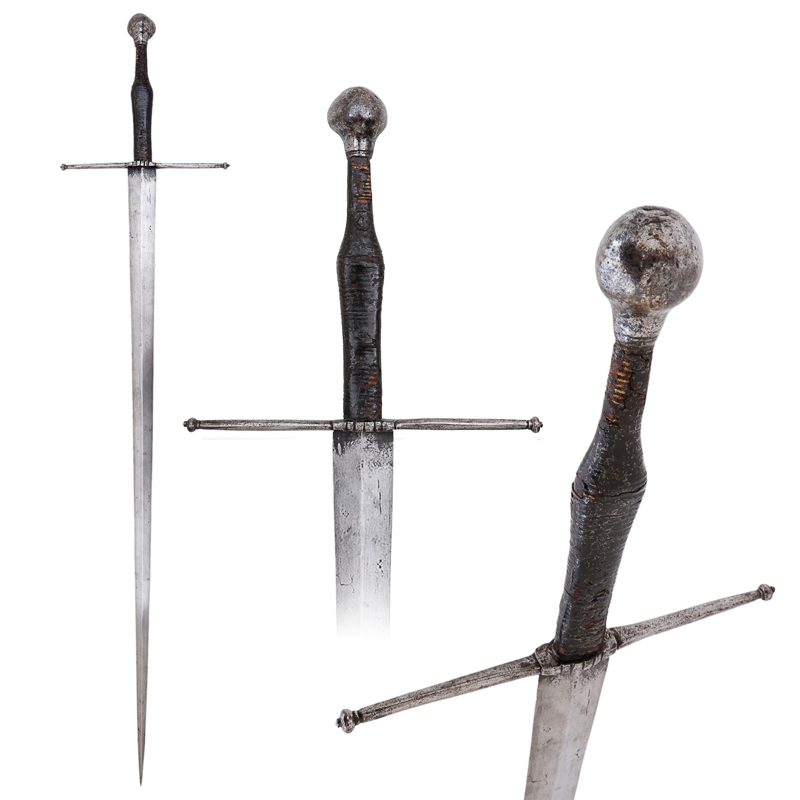 The Wallace Collection swords A.480 and A.534 bear similar marks. Strong blade of lenticular cross-section, small remnants of brass inlay on the upper third. S-shaped curved, roped quillons with flat finals, single ring-guard. Later addition of leather grip. Spirally-grooved pear-shaped pommel. Fig-shaped pommel spirally fluted (writhen) and gadrooned; shouldered wooden grip bound with cord; slightly forward-curving quillons, flat and widening at the ends, decorated with roping on the left side and bordered with lines on the other, a side-ring chased with baluster ornaments in the middle and ending in grotesque heads, is applied to the quillons on the outside side; on the other side a semi- Pas D`ane connected by a slanting ring. Broad, associated stiff double-edged blade, of hollow-ground diamond cross-section and bearing a maker's mark on each side. They are allegedly from Southern Germany (possibly Austria) around 1590. 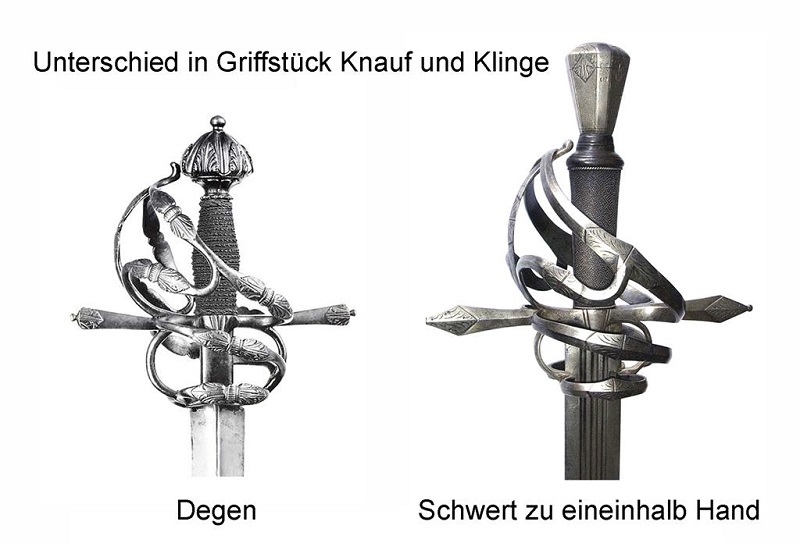 I do not know where the "neater" right sword in the comparison photo is, and it could be an antiqued replica (as Nathan pointed out in a discussion on Facebook that it looks a bit too identical to a Patrick Bárta replica). 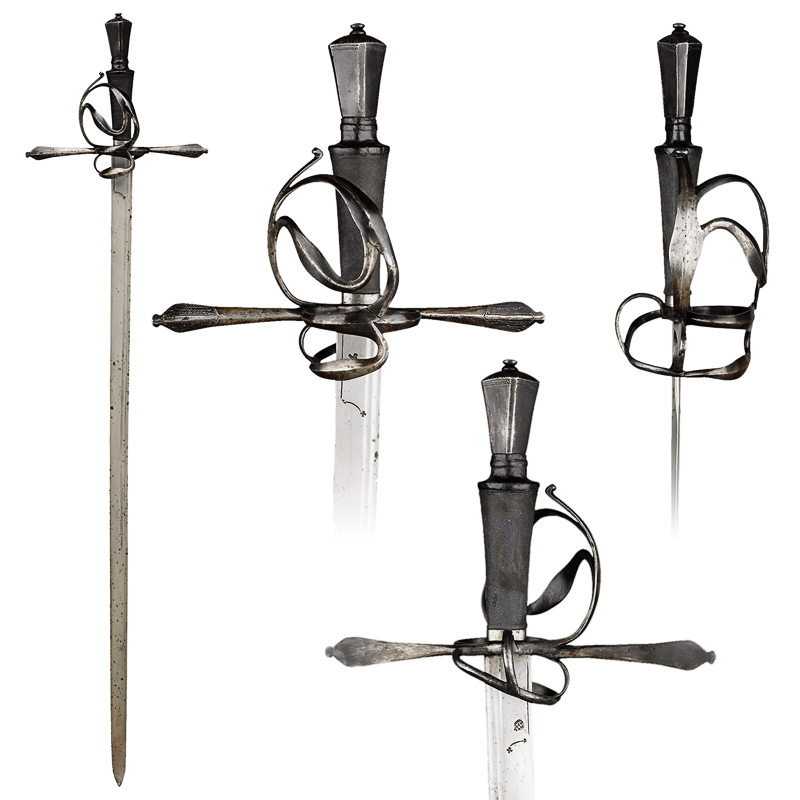 The other sword of that style is allegedly in the Kunsthistorisches Museum in Vienna, sadly not on display. All rights to these images go to their respective creators. Sadly I do not know who took them. With broad double-edged blade (some pitting) incised with a running wolf and orb and cross mark (originally latten-filled) within the fuller over each face of the forte, hilt comprising tapering quillons of circular section each spirally-fluted over half their length to the tip, large written stopper-shaped pommel (button replaced), and bottle-shaped grip covered in brown leather. Straight blade, slightly pitted, each side having a shallow fuller with a brass inlaid mark on one side. 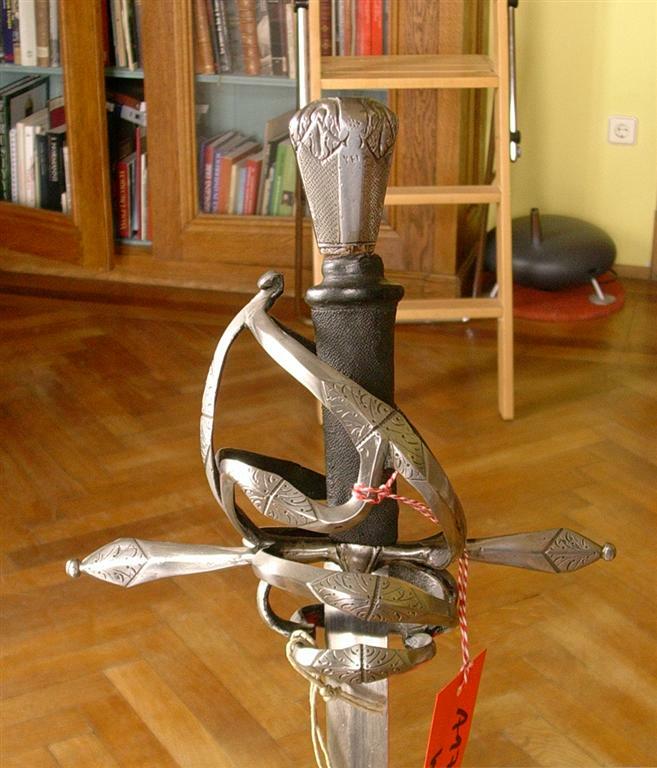 Hilt parts are all sparingly engraved with floral motifs. Straight quillons flare out and have knobs at end. Rear-guard with thumb-ring. Leather grip cover with wool (replacements). English-styled pommel geometric decoration. Blued hilt similar to The Wallace Collection Nos. A.480 and A.483. Cone-shaped pommel flattened octagonal section; oval grip bound with fish-skin; straight, spatulate quillons; knuckle-guard, side-rings, counter-guard and Pas D`ane connected to form a forward cage; all are ribbed and triangular in section; the double-edged blade of flattened hexagonal cross-section, trebly grooved towards the hilt, has a strong ricasso, and bears the running-wolf mark on one side, inlaid in brass. 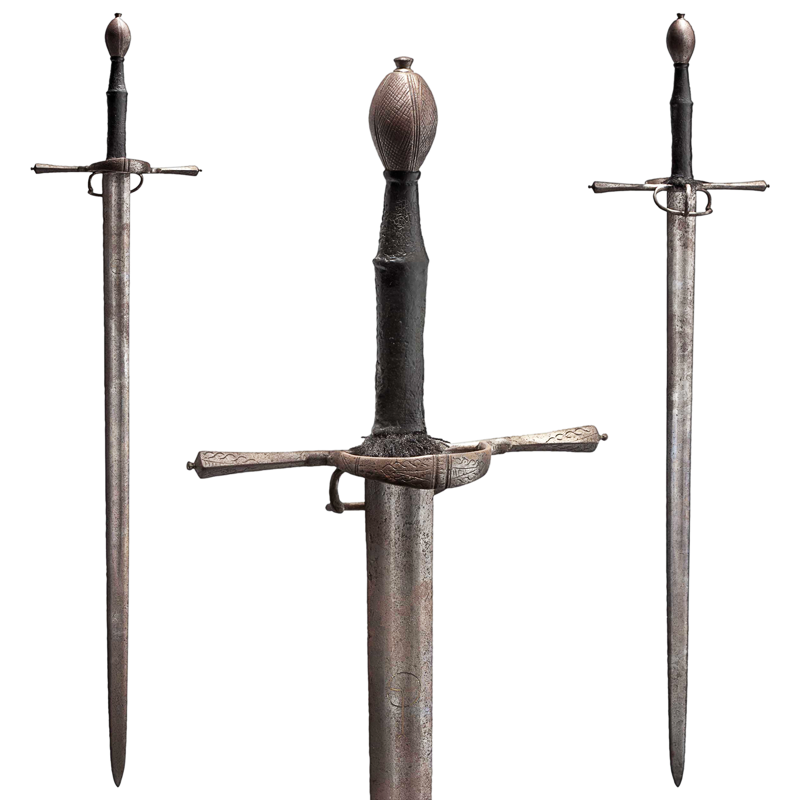 This sword was made for use against armor on foot or horseback. Its uniformly tapering stout diamond section blade is most suitable for thrusting and capable of penetrating all but the thickest armor. The throat area between the breastplate and helmet was particularly vulnerable as the requirement for articulation necessitated thinner plates. 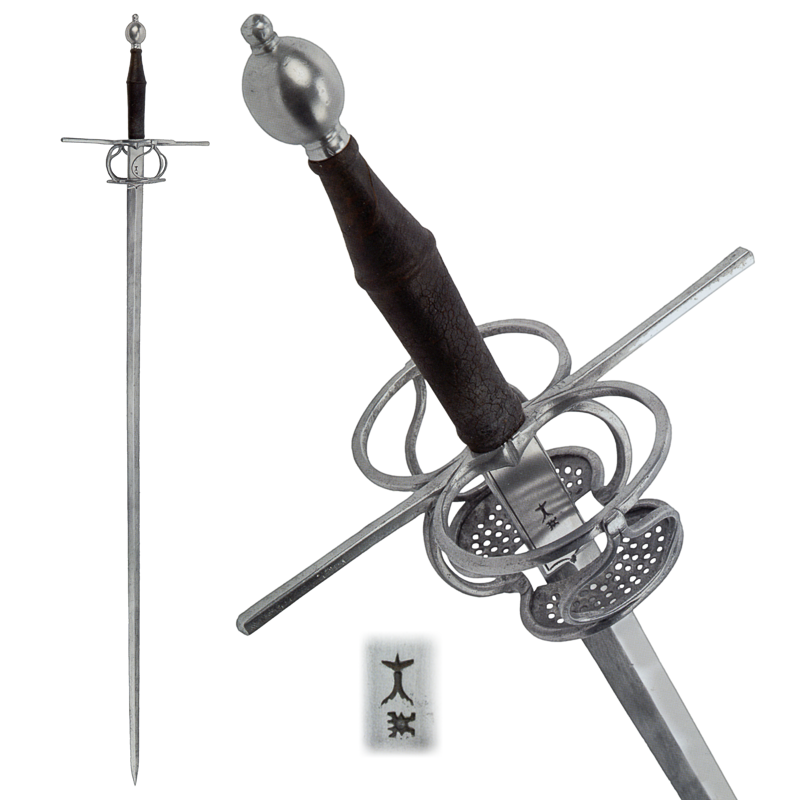 The simple straight cross-guard evolved directly from the classic medieval cruciform sword. The elongated hock bottle grip is a rare original, made to accommodate both hands comfortably for maximum effect. The pommel is sized to balance the blade at its distance and the foot continues the sweep of the grip completing the rest for the left hand. 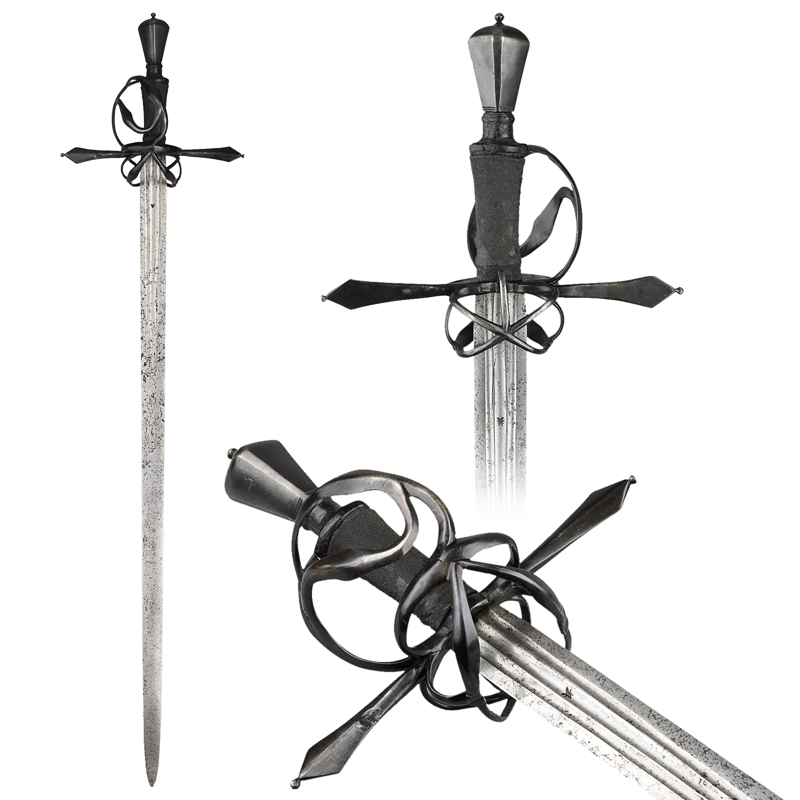 This sword was made for a man at arms prepared to fight to the death in every encounter. The increased leverage of a two handed attack is at the price of a left hand defense. Each attacking blow must be met with the sword and a productive strike is possible only when the opponent fails to do so. The very stuff that medieval legends are made of! Copyright © 2015 Faganarms, Inc. 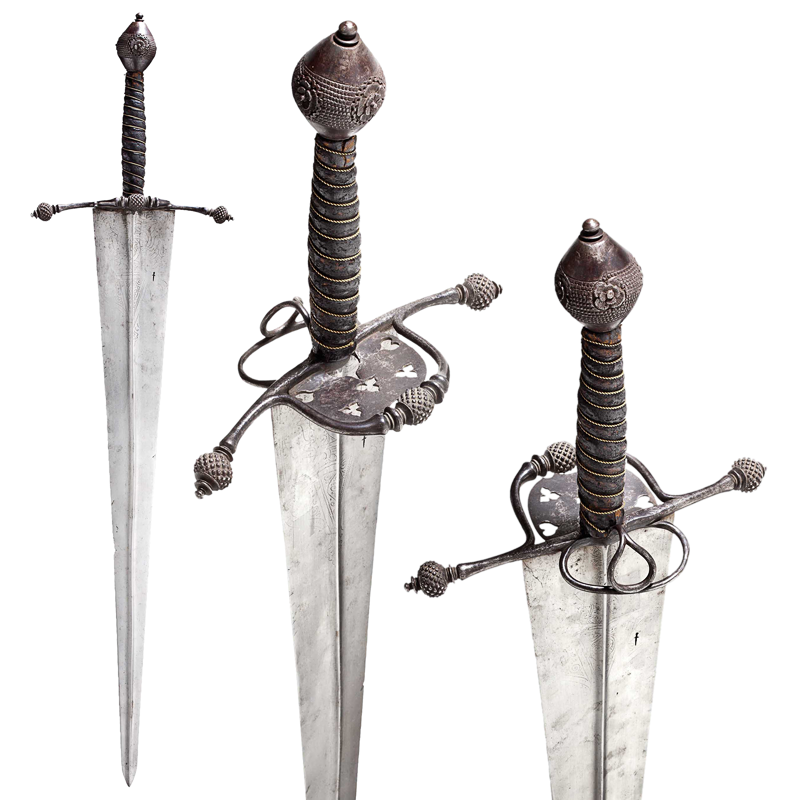 This fine sword was made for combat between two mounted fully armored knights. 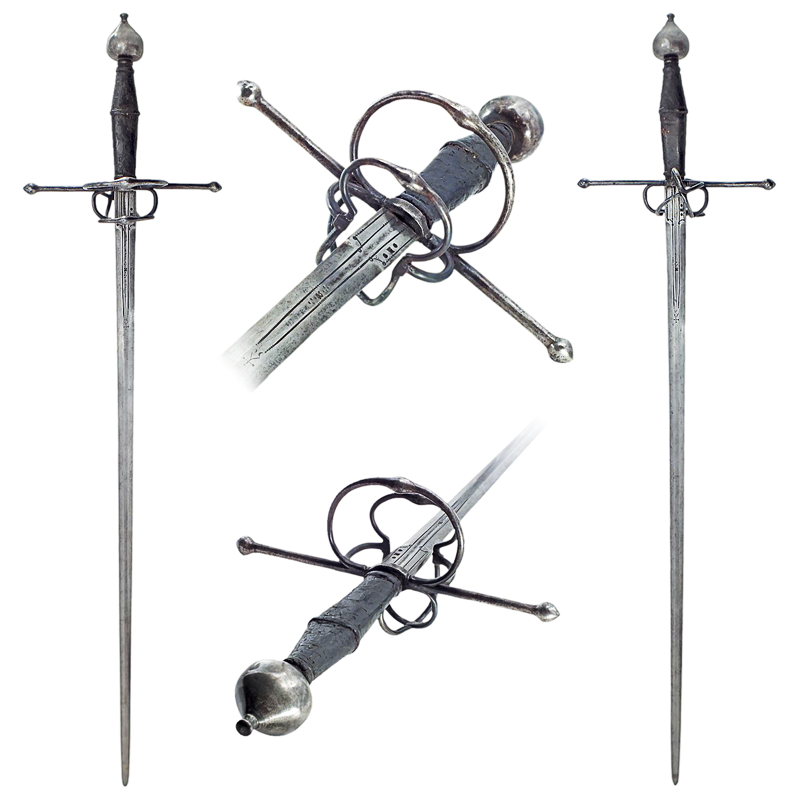 The long blade can deliver effective blows as the distance between two excited horses fluctuates as well as deal with an attack from the ground. It is made for breaching armor by thrusting or hacking and the edge is sharp enough to cut or pry loose a leather fastener. The articulation of armor necessitates gaps through which fatal thrusts could be made. Incapacitating a knight with a limb wound could provide the opportunity for a thrust to the throat or chest through the arm opening. Aside from unseating the rider, the first objective was to breach his armor. This is the tool for that task. It is beautifully made and reflects the latest technology with double ring guards and a semi basket opposite. Double-edged, slightly ridged blade. Three fullers extend in the uppers section of the blade with two additional fullers and a maker's mark in the ricasso. Wide octagonal quillons with slightly flared ends. Double ring-guards on both sides attached by finger-rings. Slender, stepped leather grip with leather. Pear-shaped pommel with slight faceting. 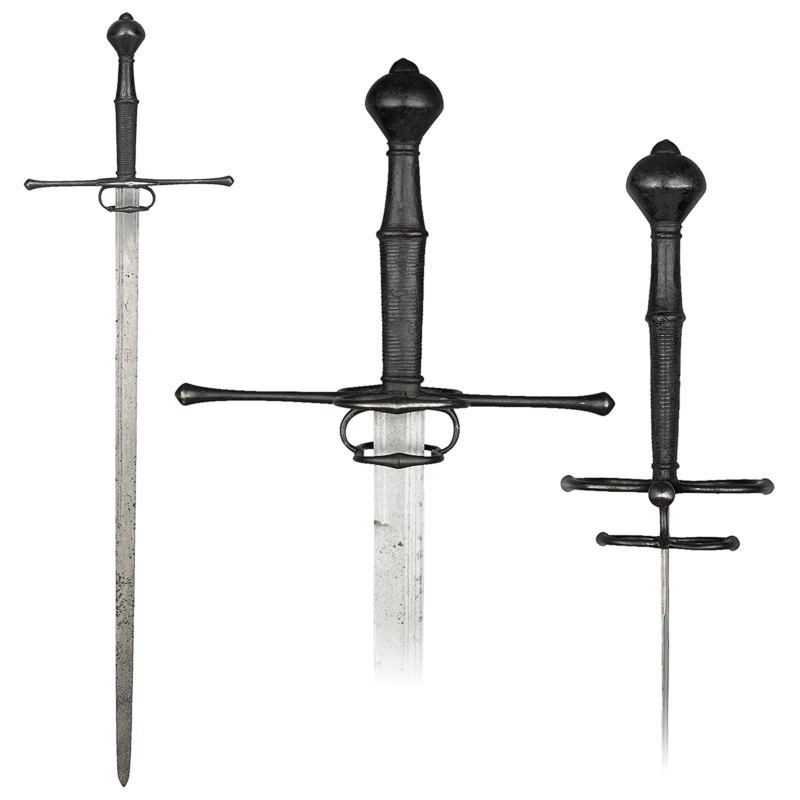 Blackened hilt similar to The Wallace Collection Nos. A.483 and A.485. Cone-shaped pommel of octagonal section; shouldered grip of wood bound with fish-skin; long-straight, spatulate quillons engraved with feathering at the ends on one side; knuckle-guard, side ring, Pas D`ane, and counter-guards, all ribbed and triangular in section; single-edged blade (except towards the point), double-fullered and stamped with a maker's mark.